Here you will find answers to frequently asked questions by our clients. We’ve covered a range of information from product production to product shipping. If we haven’t been able to answer your question here please contact us directly and we’ll assist you as soon as possible. How many vials can I fit into a bio-bottle? All bio-bottles on our website are accompanied by a product description which will include the capacity, height, diameter and opening of the inner bio-bottle. For example: a blue bio-bottle has an inner capacity of 0.85L, height of 165mm, diameter of 95mm and opening of 70mm. By using these measurements you will be able to see if the particular vials you are using will be suitable for this bio-bottle. Can I get a sample of the product I'm interested in? Yes, if you are a new client to bio-bottle New Zealand Ltd and are interested in one of our products we are happy to provide you a sample. Please contact us today. What kind of things can the ultra-freeze range be used for? The ultra-freeze complete and ultra-freeze MAX originated from a request to courier ligaments internationally, however with the ongoing development in this range (introduction of the ultra-freeze Plus and ultra-chill) many items can be couried safely internationally without the use of dry ice. This can include food samples, vaccines, blood products, plasma, tissue samples, and serums. You are welcome to place an order online by using the “add to quote” button and proceeding with the checkout for this function, or by emailing our sales team directly with your purchase order. No, there is no minimum order quantity for those ordering products within New Zealand. Yes you are welcome to collect your items from our warehouse either in person or a transportation company on behalf. Please let us know you would like to collect on placement of your order so that we can package your order suitably. If a transportation company is collecting on your behalf we will provide you the weights and dimensions of your order once it is ready for collection. I need my product urgently. Help me! Don’t panic and give us a call. We keep a minimum supply of all products on hand. It’s possible we can despatch your order same day, or if you’re in Auckland we can have this on a same day delivery service. Can I collect my product from one of your Distributors? If you would like to collect your product from one of our Distributors please contact them directly to see if they can further assist you as this will depend on the Distributors operations. What is a UN certification? The outer shipping containers of all materials containing “infectious substances” transported must have UN (United Nations) Certification and the outer shipping containers must bear a label reflecting this certification. Is my substance a UN2184 Infectious Substance, UN2900 Infectious Substance, UN3373 Biological Substance Category B, Except Human Specimen or not subject to the IATA DGR? 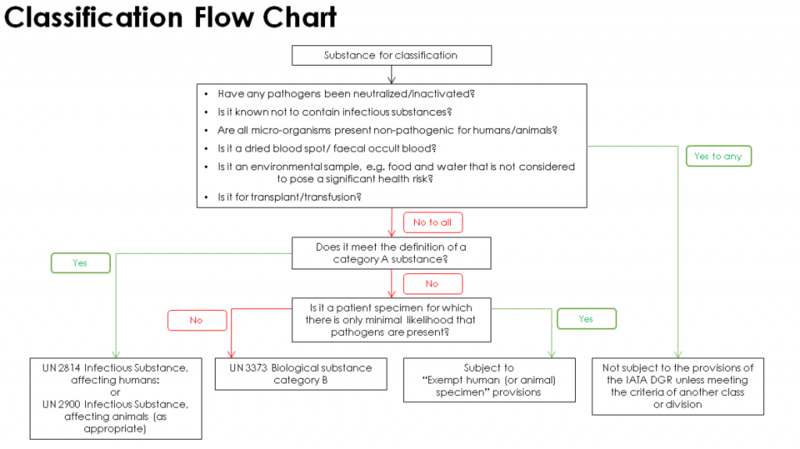 If you are having difficulty classifying your substance please review the below classification flow chart which can assist. How do I package a biological substance for transportation? Our sister company Dangerous Goods Management offers an IATA Infectious Substances by Air Course. This course is specifically designed for shippers of infectious and biological substances by air, their agents and airline operator acceptance staff. The course carries International Air Transport Association (IATA) and Civil Aviation Authority of New Zealand endorsement. We recommend attending a course to provide you with the relevant training needed.